The Divine Principle ... is truth in its fullest meaning, but not the Bible word by word. The Divine Principle clearly shows how the Bible is symbolic and how it is parabolic .. . The Divine Principle gives the true meaning of the secret behind the verse. (1) Until our mission with the Christian Church is over, we must quote the Bible and use it to explain the Divine Principle. After we receive the inheritance of the Christian, we will be free to teach without the Bible. (2). Biblical truth, therefore, is not viewed as absolute, but is a source of teaching "parables and symbols" that must be restated as a prophetic "updating" for modern man. So the Bible is actually then reinterpreted in many of the spiritual concepts expressed in the Divine Principle to "enable" contemporary humanity to understand the "truth"! Moon, in referring to the Principle as a "new truth" with which the "fundamental concepts" found in the Bible can be "recognized", sets forth his interpretation as the truly authoritative rendering of what it really means. This is an unequivocal and final rejection of the authority of Scripture for the sake of Moon's new method of "expression" of it's truth. This is evident throughout the book - and other discourses by Moon - which subtly incorporates many elements of non-Christian influence such as Korean interpretations of Buddhism, Taoistic dualism, and Korean folk religion with its emphasis on the ancestral spirit world and shamanism. Although cloaked in page after page of Scripture references and teachings based on Bible passages, enough Biblical truth is expressed to cover these emphases with a cloak of orthodoxy and legitimacy. This surely is the foundation of what has been called "heavenly deception" by Moon recruiters in the 1970's, the blurring or dissolution of the lines between what is true and what is false for the sake of Unification goals. So we can see that in the Divine Principle, Unificationism actually redefines Christian theology completely. It describes God as a divine energy based upon dual qualities of male and female (thus denying God's Triune nature as Father, Son and Holy Spirit), the Fall of man as entirely sexual in nature, presents Korea as the new Israel and the "True Father", the "Lord Of The Second Advent" as the real savior of mankind (with his wife being - of course - the "True Mother"). Jesus is said by the Principle to be merely a perfected man who could not be said to truly be divine, and whose only claim to God-likeness was that he had no original sin. His mission was to restore the "holy lineage" of "holy children" untainted with the stain of Adam's original sin, but due to his failure to take a wife and produce this offspring, his task of fathering these sinless children was left undone. Using intricate systems of chronological calculation, the book further asserts that two dispensations of time have passed in a precise order that ensures that God's plans for this "true family," thwarted in Jesus failure' at the cross, are being fulfilled at this time. 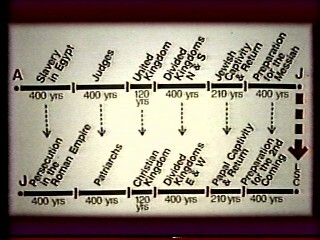 These dual dispensational periods are dated in spans of 2000 years each (as seen in this Unification chart used to define these time periods as portrayed in those 1985 videos), and just as Jesus came 2000 years after Abraham's patriarchy, the Divine Principle claims, so will the second coming of the Messiah come 2000 years after the death of Jesus, whose resurrection was not physical, but spiritual in nature. 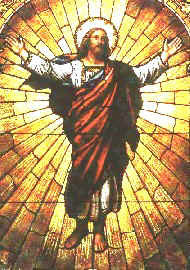 Just as divine intervention in history wrought in Israel the changes necessary to have brought forth Jesus, so the Divine Principle argues, God again moved providentially in history to use Korea to bring forth "the Lord of the Second Advent", "that one individual who can meet God's standard .. one person, one single man, a central figure" (5). That person, of course, was none other than Sun Myung Moon, whose spiritual calling stemmed from a divine revelation received as a 16 year old Presbyterian boy in prayer on a Korean hillside, a scenario not at all unlike many other groups across history (Joseph Smith, founder of the Latter Day Saint Church, in one well known example, also claimed to have the same kind of heavenly vision that authorized his "restoration" work). God has specially chosen Moon of Pusan to usher in the restoration of all things, a humble, simple man as unassuming and obscure as Jesus of Nazareth surely was. And also like these same groups, Unification apologists freely use the Bible to support their positions with a haphazard series of prooftexting and then cast it aside again when it doesn't, as Tom McDevitt, a Unification minister did in one of the 1985 videotape sets that the Unification Church distributed across the United States. 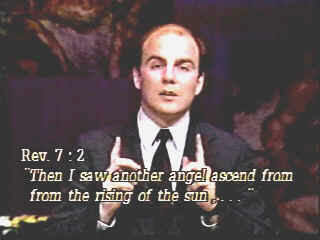 At the very climax of his presentation, McDevitt cites Revelation 7:2 as a reference to the emergence of an "angel" from the direction of "the rising of the sun" and points out that this prophetic passage could only be referring to the Messiah's emergence in a "Eastern country" .. like Korea! For the record, McDevitt doesn't address one question raised by his interpretation, namely, why Moon, while living in Korea itself, didn't view the "Eastern country" as a reference to a country other than Korea since it was there where the supposed revelation from God was sent (a logical and reasonable explanation would have been the United States itself. As the "True Father", come to finish the work Jesus failed to complete, Moon's mission is simple to understand - he is the Lord of the Second Advent come to save the world by his perfect life. This global salvation is accomplished by what Unification thought calls "True Marriages." These marital unions are arranged by Moon's match-making and ensure that his blessing of a spiritually pure-blood lineage be granted to those who submitted to his spiritual authority, namely, members of Unificationism. Only this "blessing" could assure a Unificationist a place in Heaven, as well as their adherence to Moon's strict rules of conduct, active work in spreading the Unification gospel, and their ability to pay what is called "indemnity", a way of making amends for the sins of mankind both past and present to pave the way for the establishment of the Kingdom of Heaven. Indemnity is what Moon's true believers fall back upon when they fail to advance, in whatever way, the principles of Unificationism in some pragmatic manner, and can include large donations to the movement, all night sessions of prayer, repentance, cold showers, and many other arduous things. Jesus, in the place of Adam as the Son of God, should have received as his bride the younger sister of someone in an archangelic position. That bride was to have been none other than Zechariah's daughter, the younger sister of John the Baptist. To fulfill this in a world where Satan plays the role of owner and lord, Jesus needed a foundation of protection formed by absolute faith. Tragically, the entire foundation ended up collapsing around him. .. Mary did not help Jesus with the wedding he desired. She even opposed it. This was the direct reason that Jesus could not receive his bride, and could not become the True Parent; and this forced him to go the way of the cross. Faced with the opposition of Mary, Zechariah, Elizabeth, and finally John the Baptist, Jesus gave up hope for their protection as he sought to fulfill his mission. Therefore, Jesus left his home in search of a new spiritual foundation to restart the Providence of Salvation. The Lord of the Second Advent comes to perfect the foundation of God's Providence of Restoration left uncompleted by Jesus. That is to say, he comes as the seed of the original True Child to complete the ideal of creation. He comes to complete the ideal of True Parents, who are the origin of the True Love, True Life, and the True Lineage of God. He comes on the victorious foundation of the fundamental providence of God's side up to the time of Jesus. He also stands upon the victorious foundation of Jesus' life and finds the bride that Jesus could not find. Together they become the True Parents to save all humankind. The Bible, in short, is the scripture referred to here, as may be seen when studying the verse in the proper context, and not the Divine Principle. It is the Bible that has an undeniably permanent place in American spirituality, and not Moon's publications. There is neither any suggestion anywhere in the Bible that Jesus was somehow unsuccessful in his work of salvation - necessitating that someone else "complete" the work that He alone as God Incarnate could accomplish. Indeed, the whole New Testament affirms the Christian's conviction that it is is the Lord Jesus Christ alone who "hath delivered us from the power of darkness, and hath translated us into the kingdom of his dear Son: In whom we have redemption through his blood, even the forgiveness of sins" as stated in Colossians 1:13-14. Jesus' sacrifice at the cross is that basis for man's deliverance from his sin, and entrance into the Kingdom He rules over. What a relief from the spiritual maze of Eastern mysticism that Moon's teaching leads the zealous into -- but not through! It is the blood of Jesus Christ that makes one free from their sin and opens the doors of heaven to all who will trust in Him. This is the precious truth of the Gospel that Unificationism buries under it's own tradition and dogma, choosing instead to heap upon the backs of its members a morbid obsession with paying indemnity and fighting evil "spirits of doubt" to remain true to it's traditions. These are religious works that can never save, provide peace or real life to one's years in this sorrowful world. It is at Calvary that Jesus Christ utterly vanquished the power of sin and sealed the victory he has wrought over all demonic and human enemies throughout the ages since then, "able to save them to the uttermost that come unto God by him, seeing he ever liveth to make intercession for them" (Hebrews 7:25), being the only man of whom it could be said "after he offered one sacrifice for sins forever, sat down on the right hand of God; from henceforth expecting till that his enemies be made his footstool. For by one offering he hath perfected for ever them that are sanctified" (Hebrews 10:12-14). In light of this truly glorious truth, all of Moon's arrogantly claimed victories in the spirit world for spiritual breakthrough on earth, all of his asceticism and sacrifice, all that he is said to have done to save the world falls into the dust here! Moon's demand for Unificationists to perform "indemnity," an arduous series of proscribed acts aimed at paying a "fraction" of our debt to God are a futile exercise of humanly-proscribed religious works that Ephesians 2:8-9 completely explodes with the revelation of what God's real redemption is truly based upon: "For by grace are you saved through faith; and that not of yourselves: it is the gift of God: Not of works, lest any man should boast." Sadly, too many of the Christians now affiliating themselves with Moon and his organizationally- driven moral crusade bandwagon seem to be totally ignorant of his antichristian perversion of Christian orthodoxy, or find that his twisting of Biblical truth an acceptable option. We can not disagree more strongly, especially when the differences are as clear as night and day, as right from left. There is no excuse for Christians to not "know them which labour among you" (1 Thess. 5:12) and to not know who Sun Myung Moon really is and what he really stands for. We will even go even further to say this: those Christians who persist in supporting Moon's agenda in light of his antichristian assumption of being the Messiah are betraying Jesus Christ again - only it isn't for twelve pieces of silver, but for the applause of men, fat checks to someone's charity, and gold-plated watches. This is the price of sell-out and compromise, and in a day of long-prophesied apostasy before the coming of the real Lord, our blessed Lord Jesus Christ, these horrible spectacles are to expected. Yet how many red faces there will be in the Judgment! We pray that ours be not among them, and it is our earnest desire that "whosoever will" among the Christians currently giving moral support to Moon also escape this dreadful certainty by withdrawing it! (7) In The Shadow Of The Moons, p. 20.